CHARLESTON - Furman freshman quarterback JeMar Lincoln rushed for three touchdowns and junior linebacker Donavan Perryman capped a career day in style Saturday as the Paladins rallied for a 28-17 win over The Citadel at Johnson-Hagood Stadium. After hanging on for a win in a shootout with Western Carolina and dominating Wofford from start to finish, Furman didn't exactly roll up yards offensively Saturday. But the Paladins (3-4, 3-2 Southern Conference) found a way to victory by winning the fourth quarter. Doing it on the home field of its biggest rival made it all that much sweeter. 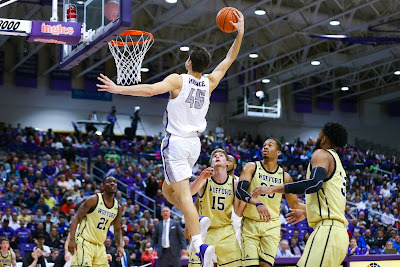 "I knew it was probably going to be one of those that goes down to the wire and I'm just really proud of our kids for hanging in there and finding a way," Furman coach Clay Hendrix said. "We've lost a couple of games like this where we might have even played better. You've just got to find a way to win." 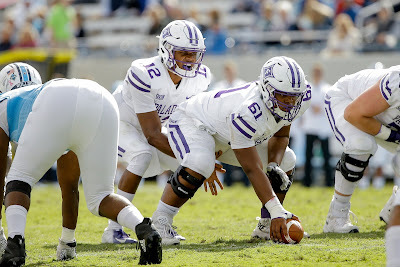 The Paladins trailed 17-14 early in the fourth quarter when Lincoln, who was making the first start of his career in place of injured starter Harris Roberts, led the go-ahead drive. After a 12-yard throw to Thomas Gordon got Furman to midfield, sophomore Devin Wynn had consecutive runs of 3, 11 and 17 yards, respectively. Lincoln's 13-yard throw to Cam Burnette set up Furman at the three. Two plays later, Lincoln scored from four yards out and Furman led 21-17 with 9:12 left. Furman forced a punt on Citadel's ensuing possession, but the ball was downed inside the one-yard line. While some Furman fans could've envisioned a nightmare scenario of a safety followed by a game-winning Citadel field goal as time expired, Kealand Dirks was having no such thought. The 250-pound senior fullback bulled his way for three yards on first down then 16 on the next play to give Furman plenty of breathing room. "We're trying to find a few more ways to get him the ball with a little space," Hendrix said. "That's something we practice (deep in your own territory) and there's just nothing easy about it. We got it out of there and then made a good punt." While the drive stalled, Grayson Atkins got off a perfect knuckleball punt that went 47 yards before bouncing out of bounds. That left the Bulldogs faced with having to go 72 yards in 2:46 for the win. On second down, Citadel quarterback Jordan Black couldn't find anyone open and held on to the ball long enough for Adrian Hope to get there. While Hope recorded his SoCon-best eighth sack, he also forced a fumble. Perryman scooped up the loose ball and returned it 20 yards for a game-sealing touchdown. Perryman fought through his first instinct on the play and recalled the coaching of defensive coordinator Chad Staggs. "At first I was thinking, 'fall on it, fall on it,' but every time we get prepared for a game we have a swarm meeting," said Perryman, who finished with a career-high 12 tackles including a sack. "Basically we line up in front of the film and each of us imagine making a play. Sometimes when the film rolls, we will say, 'we made a fumble,' and Coach Staggs always says, 'you just want a fumble? Scoop and score!' So I could hear Coach Staggs yelling at me in my head as I took it to the end zone." Going into Saturday, the big question for Furman this week was who was starting at quarterback. Roberts, who suffered a concussion last week, didn't make the trip. Freshman Darren Grainger, who's taken the majority of snaps while Roberts has been out this season, didn't play Saturday. For what it's worth, Grainger has played four games this year meaning he can't redshirt this season if he plays another down. After directing a long touchdown drive in the fourth quarter last week, Lincoln got the starting call this week. While Lincoln's running ability has been obvious, there may have been some questions about his passing game. It was on point Saturday though. Lincoln, who was 5-of-10 for 40 yards passing for the season, completed 9-of-12 passes for 140 yards with no interceptions. "It's an amazing feeling right now. You just practice and prepare for moments like these," Lincoln said. "When my opportunity came, I just had to seize it and I definitely enjoyed it." The teams traded the lead four times in the first half. Lincoln's one-yard sneak midway through the second quarter staked Furman to a 14-10 lead at the half. In what was a field position game that Furman was frankly not winning in the second half, it appeared that Atkins flipped that in the third quarter. His 81-yard punt, the third-longest in school history, pinned Citadel inside the 10-yard line. But on the first play, Black hit Raleigh Webb who was running all alone downfield on a 91-yard touchdown. The longest pass in Citadel history gave the Bulldogs a 17-14 lead with 6:46 left in the third quarter. Outside of that play, Staggs' defense once again did a wonderful job containing a run-happy, triple-option team. The Bulldogs, who were ranked seventh in the FCS in rushing at 282.3 yards per game, were limited to 157 yards rushing on 46 attempts Saturday. "Our defense gave us a chance," Hendrix said. "Other than a couple of busts, they played pretty darn good." On a day that Furman played without its best offensive lineman as Reed Kroeber was out due to injury, the Citadel piled up 12 tackles-for-loss. But the Paladins got the critical yards when needed in the fourth quarter and perhaps most importantly, had no turnovers. Wynn finished with 86 yards on nine carries to lead the rushing attack, while Burnette had four catches for 71 yards and Gordon had 67 yards receiving on four receptions. "Kealand and Devin really stepped up when we needed them most," Lincoln said. "We have a lot of faith in our backs and I definitely wouldn't have gotten those touchdowns without them." 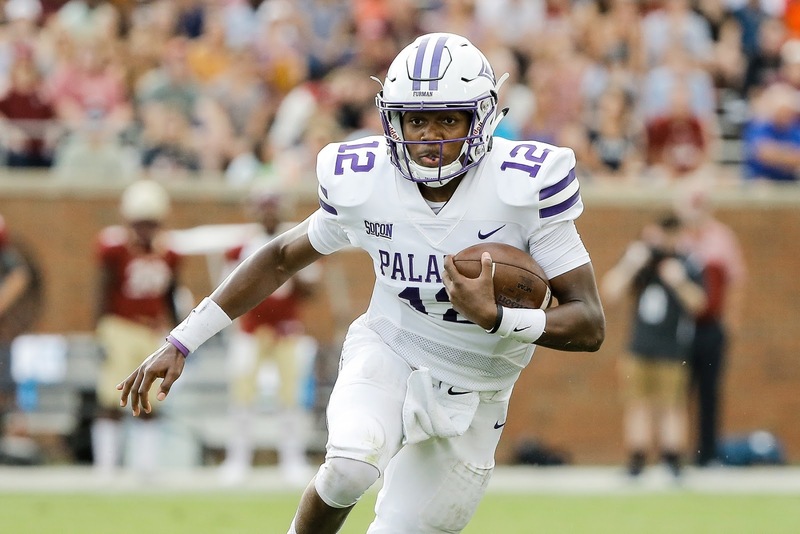 The biggest question surrounding Furman is who will start at quarterback when the Paladins take on rival The Citadel Saturday at 2 p.m. in Charleston. The next biggest question is how many will play, no matter who starts. Fresh off a Southern Conference Player of the Week performance in a 34-14 win over Wofford, starter Harris Roberts was knocked out after a vicious hit in the first quarter in last Saturday's 38-25 loss to Samford. During his coaches show on Thursday night, Clay Hendrix said that Roberts is still "day-to-day," and was "quite limited" in practice this week. "All three of our other guys got most of the (practice) reps and I thought all three did really well," Hendrix said Thursday. "We will make that decision and even when we make it, we probably won't share it until we go out there." As Roberts worked his way back from a broken thumb in the preseason, he was getting better and better each week and bringing a spark to the offense. The senior captain appeared to have a calming influence over the squad as well. Without Roberts last week, the Paladins turned to freshman Darren Grainger. While Grainger's shown a cannon for an arm - highlighted by last week's 77-yard touchdown pass to Thomas Gordon - and flashes of what could make him Furman's quarterback of the future, he's been hurt by turnovers. Last week, it appeared that the Paladins could be going in to possibly take a 26-10 lead, but Grainger lost the ball. Samford All-American Ahmad Gooden scooped up the fumble, ran 58 yards for a touchdown and completely turned the game around. Grainger left in the fourth quarter after being banged around by Gooden and his teammates. JeMar Lincoln came on for the first time since week two and directed Furman on a 14-play, 80-yard scoring drive capped by his five-yard touchdown pass to Avery Armstrong. "They still had their first team defense in and I thought he managed it well and did a good job getting us in the end zone," Hendrix said after last week's game. "He's a pretty dynamic athlete and a really bright kid. "The first person to greet JeMar as they were coming off the field (after the touchdown) was Darren. That's how he is all the time. He's got a bright future." While experiencing the highs and lows that freshman quarterback everywhere may face this year, there's one thing worth remembering when assessing Grainger. Two years ago at this time, he was a junior wide receiver at Conway High. The other quarterback possibility this week is freshman Hamp Sisson. Sisson quickly made a big impression on coaches in the preseason, but has yet to see the field this year. Given the new rule about redshirting, Sisson could play in each of the final four regular season games and still redshirt this season. After playing the No. 1 rushing team in the FCS two weeks ago and the No. 1 passing team in the country last week, Furman goes back in the other direction again. The Citadel enters Saturday ranked seventh in the country in rushing at 282.3 yards per game. Furman's chances of winning Saturday would be greatly boosted by another standout performance against the option by a Chad Staggs' coached defense. As a defensive coordinator at Charleston Southern and Furman, Staggs is 5-0 against the Bulldogs. In last season's 56-20 win over Citadel, the Paladins allowed just 146 yards on the ground - about 180 yards below the Bulldogs' average at the time. Furman was setting itself up for a storybook Saturday on homecoming against Samford. The Paladins appeared poised to somehow pull off a win with their backup quarterback taking over in the first quarter, with all their first-half scoring coming from their kicker and against a team that had scored 139 points over its previous two games. But when adversity hit midway through the third quarter, Furman suddenly remembered how young it is and had no answers. Samford scored four touchdowns in a span of just more than 10 minutes of game time in the second half to rally for a 38-25 win. "It was just an odd game that turned quickly. We're a team that hasn't responded really well to bad things happening. We've just got to respond better and we've got to learn how to take care of the ball," Furman coach Clay Hendrix said. "I don't think it was effort. I don't think it was toughness. We're playing hard, we're just not playing smart sometimes and not executing." The Paladins (2-4, 2-2 Southern Conference) led 19-10 and were looking for more after senior captain Aaquil Annoor returned an interception to the Samford 37-yard line with 9:28 left in the third quarter. On the next play, Corey Watkins carried for 12 yards to the Samford 25. Then it happened again. It being Darren Grainger getting hit from behind on an option play and losing the football. The ball was scooped up and returned for a 58-yard touchdown by reigning SoCon Defensive Player of the Year Ahmad Gooden as Samford cut the lead to two. It was Grainger's first lost fumble since the first play of the Elon game in week two. Just like on Saturday, that loose ball was returned for a touchdown. And just like at Elon, things went from bad to worse in a hurry for Furman. On the third play of the Paladins' ensuing drive, Samford's Nick Barton intercepted a tipped ball giving the Bulldogs (4-4, 3-2) the ball at their own 44. Six plays later, Samford quarterback Devlin Hodges - who became the SoCon's career passing leader Saturday - hit Chris Shelling on a nine-yard touchdown giving the Bulldogs the lead back for good. "I thought we had a great play (on the fumble). I thought all we had to do was pitch it. But their guy's a great player and he made the play," Hendrix said. "I thought we had a chance to really take control of this thing. You're thinking worst case there we go up 22-10. "Then the whole thing just flipped on us." After a three-and-out by Furman, Samford needed just 94 seconds to drive 76 yards, capped by a seven-yard touchdown run by Hodges. The Paladins nearly made an interception on a third-and-15 play on the drive, but an offsides penalty gave the Bulldogs another shot and Hodges made a 23-yard throw for a first down. Another three-and-out by Furman was answered with another touchdown drive by Samford. On third-and-10, Hodges was flushed from the pocket. After rolling to his left, Hodges stopped and threw across his body to a well-covered Jai'Rus Creamer for a 30-yard touchdown as the Bulldogs pushed the lead to 38-19 with 13:17 left in the game. Samford converted a pair of third down conversions on that drive and was 3-for-3 on third down on its first touchdown drive of the game. A week after limiting Wofford to 3-of-11 conversions on third down, Furman allowed Samford to convert 8-of-14. "Getting off the field on third down was tough," Hendrix said. "Third-and-15 and we jump offsides is just inexcusable." 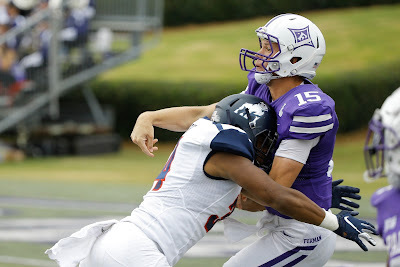 Furman trailed 10-3 late in the first quarter when staring quarterback Harris Roberts was knocked out of the game on a play that would've gotten the Samford defender fined in the NFL, but wasn't flagged Saturday. It appeared that after being driven into the ground, the back of Roberts' helmet hit the ground hard. The Paladins turned to the freshman Grainger for his first action since the ETSU game on Sept. 22. While missing the reigning SoCon Offensive Player of the Week under center, Furman captured the momentum on Samford's ensuing possession. On 4th-and-1 at the Furman 47, Samford's DeMarcus Ware was dropped for a two-yard loss giving the Paladins the ball at midfield. Furman ended up having to settle for a Grayson Atkins' field goal, but what a field goal it was. Atkins' 50-yard kick landed in the middle of the grass in front of the fieldhouse meaning it would've been good from 60-something. That gave the Paladins' momentum another boost. Atkins was just getting started. He boomed a 51-yard field goal on Furman's next possession. On the final play of the first half, he nailed a 53-yarder to give the Paladins a 12-10 lead. That tied the Division I record for most field goals of at least 50 yards in a single game, which was last done by Wake Forest's Sam Swank in 2006. "Hats off to Samford. Their defense was really good and put us in some spots where we had to kick some long ones," Atkins said. "I certainly didn't think going into this game I'd have four field goals. I was hoping for one or two and a bunch of extra points. "We'd only had three field goal makes this year, so it felt good to keep the momentum going in the first half." Grainger's first two deep throws might have gone for touchdowns but the first one was dropped and the second was a slightly overthrown rocket. The third time turned out to be the charm. On Furman's first play of its second possession of the third quarter, Grainger faked an option run look, pulled back and hit Thomas Gordon in stride for a 77-yard touchdown. Following that play, the Paladins had just 19 yards of total offense over its next four drives as Samford took command. Hodges finished with 402 yards on 40-of-52 passing and was Samford's leading rusher with 45 yards on 12 carries. In addition to breaking the SoCon career passing yards record Saturday previously held by Elon's Scott Riddle, Hodges also broke the FCS record for career completions. He now has 13,377 passing yards and 1,198 completions in his career. "It's hard to stop anybody if they complete close to 80 percent of their passes," Hendrix said. "We didn't get to him very good, but we certainly didn't help our defense a lot offensively." Meanwhile, Samford's defense was led by Gooden who terrorized Grainger all day. He finished with nine tackles, including four for loss and two sacks. He also had two quarterback hurries and a pass breakup along with his long fumble return for a touchdown. Furman sophomore running back Devin Wynn, who made his first career start Saturday, had a team-high 83 yards rushing on 13 carries. Watkins rushed for 78 yards on eight attempts. A week after containing the leading rushing team in the FCS, Furman gets a shot at the nation's leading passing team. Coming off their most impressive performance of the season in a win over Wofford, the Paladins host Samford on homecoming Saturday at 2 p.m. Led by senior star quarterback Devlin Hodges, the Bulldogs (3-4, 2-2 Southern Conference) are averaging 387.3 yards passing per game. That's about two yards less than what Wofford's ground game averaged per game entering last Saturday before being held to 247 in Furman's 34-14 win. Hodges, who's on pace to obliterate just about every SoCon career passing record, leads the FCS in passing yards (2,674 yards) and touchdowns (24) and ranks second in completion percentage (70.4). No other FCS player has more than 2,081 yards or 16 touchdowns. "They're really talented. If you went to pick out teams a bunch of their players would get picked just standing there with their size, quickness and speed," Furman coach Clay Hendrix said. "We're getting better. We just have to keep improving. "We've just got to find a way to make him (Hodges) a little uncomfortable." Therein lies what Hendrix called a double-edged sword though. Furman (2-3, 2-1) will at time be faced with a decision on whether to blitz Hodges or drop back in coverage. In Samford's fast-paced offense, Hodges gets rid of the ball quickly. One factor in that decision could be the recent play of the Paladins' bandits. Starter Chris Washington has been on a tear of late, while reserve freshman Adrian Hope leads the SoCon in sacks with six. 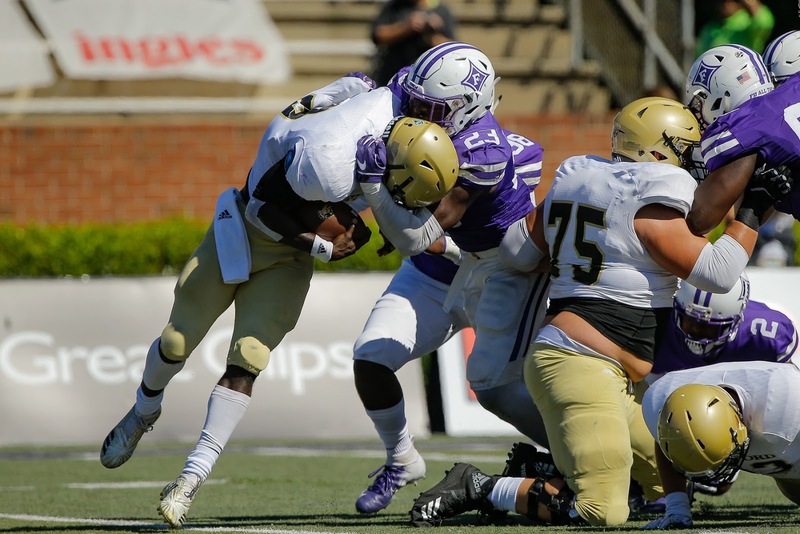 After a 12-tackle performance in Furman's win over Western Carolina, Washington had six tackles, including 2.5 for loss, a sack and a huge forced fumble against Wofford. Against the run-heavy Terriers, sack opportunities were limited for Hope last Saturday but he still made a big play with a pass breakup on third down that forced a Wofford punt. "The last two games, Chris Washington has shown up better than at any time that I've been here," Hendrix said. "He's always been a solid player, but he's just taken it to a different level. "Adrian's already proven he's pretty good at the pass-rush stuff and he's working to get better at the other stuff. You certainly hope he's a guy (to contribute) this week." Obviously, Furman's secondary will be tested Saturday and having all hands on deck will be a key. Hendrix said that starting cornerback Amir Trapp should be back this Saturday, while fellow starting corner Quandarius Weems could return. Trapp missed last Saturday's game because he could not risk having stitches come out from where he had a cyst removed. Weems has been out since suffering a knee sprain at Elon on Sept. 8. Offensively, the Paladins will look to build on the momentum they've gained of late. After scoring a total of five touchdowns over the first three games, Furman has five offensive touchdowns in each of its last two games. "You'd like to limit their possessions and the best way to keep them off the field is to keep the ball. ... We had that nine-minute from the third to fourth quarter last week and I wouldn't mind a couple of more of those," Hendrix said. "They graduated a few guys, but they're pretty solid defensively. "Historically, they play a different defense against a so-called option team but I don't know how they view us right now. So it will be an interesting match-up." Samford, the SoCon's consensus preseason favorite, had a rough September. After a season-opening win, the Bulldogs had five turnovers to blow an excellent chance of winning at Florida State, which started a four-game losing streak. The Bulldogs have righted the ship in October with a 66-28 win over Western Carolina and a 73-22 victory over VMI. While both Furman and Samford made last season's FCS playoffs, Saturday's game could be a must-win for keeping postseason hopes alive this year. at the second annual Dins After Dark preseason basketball event. Furman fans got their first look at the 2018-19 men's and women's basketball teams at the annual Dins After Dark event Thursday night at Timmons Arena. After the Paladins' new court was unveiled at last season's inaugural event, large new video boards were on full display for the first time Thursday. As the event wrapped up with a dunk contest, Furman sophomore forward Clay Mounce provided plenty of highlights for the boards to replay. Mounce bested freshman Jalen Slawson in the finals with a pair of dunks that drew the highest ratings of the night from a panel of judges that included former players T.K. Hayes and Kendrec Ferrara. Senior Brady Schuck set up Mounce's first dunk of the finals. Schuck dribbled along the baseline and flipped the basketball off the side of the backboard. Mounce went up and caught the loose ball and did a 360 spin before throwing it down. Mounce went between his legs on his way to the hoop on his final slam. While the event was a fun evening of entertainment for players, coaches, students and fans, it's just another part of enhancing the basketball experience at Furman. It's no coincidence that it's coincided with the men's program turnaround over the last few years. "We've gotten a new court, redone the lights and now we've got the video boards. We just have to continue to find ways to make it better," Furman men's coach Bob Richey said. "When you're trying to build a program, you've got to build it from all angles. You can't fall in the trap of saying, 'we're just going to recruit or just watch film.' You've got to attack the whole thing. "It's fun just looking at where we've come on this journey and continuing to progress it." Prior to the dunk contest, Richey provided some of his own highlights in a 3-on-3 tournament between the coaches and students. The student team looked to have an advantage as it consisted of Furman football players. But this year's coaching team included a new assistant by the name of Daniel Fowler. What was a fun exhibition of make-it, take-it "21" turned out to be quite an entertaining contest. Fowler, a 2017 graduate who holds the school record for games played (133), had a reverse layup to give the coaches a 19-18 lead. He then found Richey, who knocked down his fourth 3-pointer of the contest to end it. "Somebody had to make some shots," Richey said with a smile afterwards. "Daniel was by far the best player on that court tonight, but all shooters can have their moment. That's the only thing I could do out there." Dins After Dark opened with kind of a mixed doubles scoring contest. Two-persons teams consisting of one men's and one women's player teamed up to see who could score the most in one minute. The team of Schuck and Hannah Sellinger won the competition, which was highlighted by Schuck nailing a half-court shot. The Furman men will wrap up the preseason portion of its practice schedule with private scrimmages each of the next two Saturdays. "We will have about a week-and-a-half before our first game to really touch up some things after those two scrimmages," Richey said. "You don't play scrimmages to win them. That's why they close them and the score's pretty irrelevant. You play scrimmages to figure out groupings and rotations. It's going to be good to get those under our belt." The men's team opens the season by hosting Bob Jones on Nov. 6 at 7 p.m. The women's team has a home exhibition game against USC Aiken on Nov. 1 at 7 p.m. before opening the season with a home game against Coker on Nov. 7 at 7 p.m.
Now fully recovered from a broken thumb suffered in the preseason, Furman senior quarterback Harris Roberts has shown improvement with every passing Saturday - no pun intended. Roberts earned Southern Conference Offensive Player of the Week honors this week after accounting for five touchdowns in the Paladins' 34-14 win over then No. 4-ranked Wofford Saturday. Roberts completed 16-of-19 passes for 235 yards with three touchdowns and one interception. He was also rushed for 32 yards and a pair of scores. Combined with a 3.66 GPA, that effort helped the pre-engineering major earn SoCon Student-Athlete of the Week honors as well. "Harris is a smart, tough kid who likes to play and prepares well," Furman coach Clay Hendrix said. "I think (offensive coordinator) George Quarles and our offensive staff have a really good understanding of what his strengths are. "I knew they (Wofford) were going make him keep the ball (on the option), and he's shown he can be an adequate runner." Senior receiver Thomas Gordon helped set the tone for Roberts' big day as he had three receptions for 41 yards by Furman's fourth play of the game. While Gordon led the Paladins with six catches for 70 yards, it was some unexpected targets that were big difference makers. Entering Saturday, Paladin running backs had totaled 27 yards receiving on four catches with no touchdowns over the first four games. On Saturday, tailbacks' Devin Wynn, Darius Morehead and Corey Watkins combined for six receptions for 117 yards and two touchdowns. Over last season's 13-game schedule, a total of six Furman running backs combined for 27 receptions, 262 yards receiving and two touchdowns. 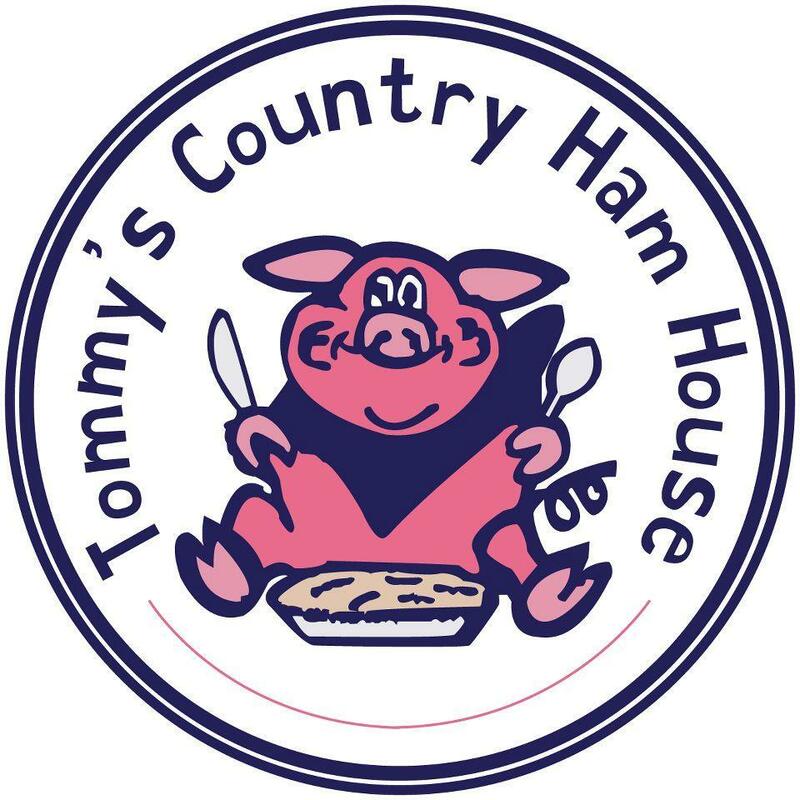 Much like last season's signature "big play" that saw bombs to a wide open receiver - typically tight end Andy Schumpert - over the middle, Saturday's big passing plays were also play-action things of beauty. Seemingly each throw to a running back happened after Roberts faked a handoff and rolled out to find his intended target standing all alone. "One of the things I struggle with in those situations sometimes is I underthrow them a little bit just to make sure I don't overthrow them," Roberts said. "But it's nice when they're wide open and they can go run for 60 yards." Was it really that shocking? Often times when a supposed underdog is facing a top five team, the "experts" will claim that said underdog must play a near-perfect game and win the turnover battle to have a chance at the upset. So for underdog Furman to pull off a 20-point win in which it held a double-digit lead from the first quarter on, they must have dominated statistically, right? Not really. Furman had one more first down, 13 more total yards of offense and a 1:22 advantage in time of possession. Each team had five penalties and one turnover. The Terriers ran 41 times and the only time they fumbled came on a play that was initially ruled an interception. Based on those factors - and the fact that the home team has now won 11 of the last 12 games in the series - it's kind of hard to consider Saturday's result a stunning upset. Hendrix certainly didn't think it was. "You can throw those two records (Furman and Wofford) out there, but I knew we'd lined up against some really good teams," Hendrix said. "I think if you watch those first two games, that's not who we are. I think we're showing who we can be and who we want to be. "I think we've got 18 of 22 guys on offense who are freshmen or sophomores. The o-line is getting better. ... You never know, but I thought we'd defend them pretty well and we did." 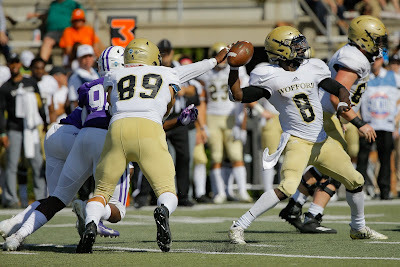 That change in the official scoring from an interception to fumble by Wofford quarterback Joe Newman made Chris Washington's big day even bigger. Furman's junior bandit finished with six tackles, 2.5 tackles for loss, a sack, a forced fumble, a pass breakup and a quarterback hurry. Furman sophomore kicker Grayson Atkins missed the first extra point of his career Saturday, snapping the longest active streak in the SoCon. The former Boiling Springs High standout made the first 68 extra points of his collegiate career, which is the seventh-longest streak in SoCon history. In Furman's previous game, the offense got a big confidence boost. On Saturday, it was the defense's turn. While the Paladins contained the most potent rushing attack in the country Saturday, Furman senior quarterback Harris Roberts kept the offense clicking as he accounted for five touchdowns. It all added up to a 34-14 win over fourth-ranked Wofford at Paladin Stadium. The last time Furman defeated an opponent ranked that high was in 2011 when the Paladins knocked off No. 3 Appalachian State, 20-10. Of more importance at the present time, the win made things a whole lot more interesting in the Southern Conference. With its 26-23 win at The Citadel on Saturday, ETSU is alone in first place at 4-0. Wofford is now second at 3-1, a half-game in front of Furman and Mercer who are each 2-1. While Furman (2-3) didn't pile up nearly 600 yards of total offense like it did the last time out in a 44-38 win over Western Carolina, the offense was efficient and had statement-making scoring drives Saturday. The Paladins had touchdowns on the opening possession of the game, their last drive of the first half, their first drive of the second half and on a win-sealing drive that took more than nine minutes off the clock. Furman was 7-of-12 on third down, 1-of-1 on fourth down and had touchdowns on all four of its trips to the red zone. Meanwhile, Wofford was 3-of-11 on third down and 1-of-4 on fourth. "Hats off to our (coaching) staff. They just did an unbelievable job prepping our kids for this. We had a tough bye week and went at it pretty hard," Furman coach Clay Hendrix said. "The kids prepared well and gave themselves a chance to go play well. I'm pretty pleased with their execution. "Other than a couple of plays where we popped an assignment and allowed long runs, I don't know if we could've gotten after them much better on defense." After each of the last two games, Hendrix mentioned that the Paladins, "probably should have thrown it more." On Saturday, Roberts came out firing. Four plays into the game, senior receiver Thomas Gordon had three catches for 41 yards. Roberts' fourth throw of the day went for a 24-yard touchdown to tailback Darius Morehead. The score was a beautifully designed play in which Roberts faked a handoff to Morehead, who then drifted into the flat and was wide open. That play-action success was a sign of things to come for Furman. The Paladins next scoring drive opened with a 15-yard pass from Roberts to tailback Corey Watkins. It ended when Roberts bulled his way to the end zone for a nine-yard touchdown on an option keeper as Furman pushed the lead to 14-0 with 2:28 left in the first quarter. That marked the Paladins' first double-digit lead in the first quarter this season and Wofford's largest deficit of the season. "It was huge for us because their offense isn't really built to come from behind," said Roberts, who finished with 235 yards on 16-of-19 passing and 32 yards rushing. "We put our defense in a good position and they played really, really well against a great team. "I think we came out today and showed that we're not just a one-dimensional team. We can win a game in multiple ways." A pair of drive-extending penalties in which it appeared that Furman had stopped Wofford on third down aided a 12-play, 67-yard scoring drive for the Terriers. On third-and-goal, Joe Newman threw a 12-yard touchdown pass to Garrison Moore as Wofford cut the lead in half midway through the second quarter. On Wofford's next possession, Chris Washington hit Newman as he threw and defensive end Chinedu Okonya came up with the interception. That set up the Paladins at Wofford's 34-yard line. Five plays later on third-and-four, Roberts hit tailback Devin Wynn on a 10-yard touchdown pushing Furman's lead to 21-7 with 45 seconds left in the half. Furman held Wofford to 90 yards rushing on 23 carries in the first half. While the Terriers finished with 247 yards on the ground, that was well below their FCS-leading average of 388.8 rushing yards per game entering Saturday. "Our coaches had a really good game plan. We just had to be assignment sound and take care of everything," said linebacker Elijah McKoy, who finished with a team-high 14 tackles. "We just trusted each other." Furman's opened the second half like they did the first half. Roberts threw a 14-yard pass to Morehead and a 49-yard pass to Wynn before hitting Ryan DeLuca on a nine-yard touchdown. The extra point failed, leaving the Paladins with a 27-7 lead. 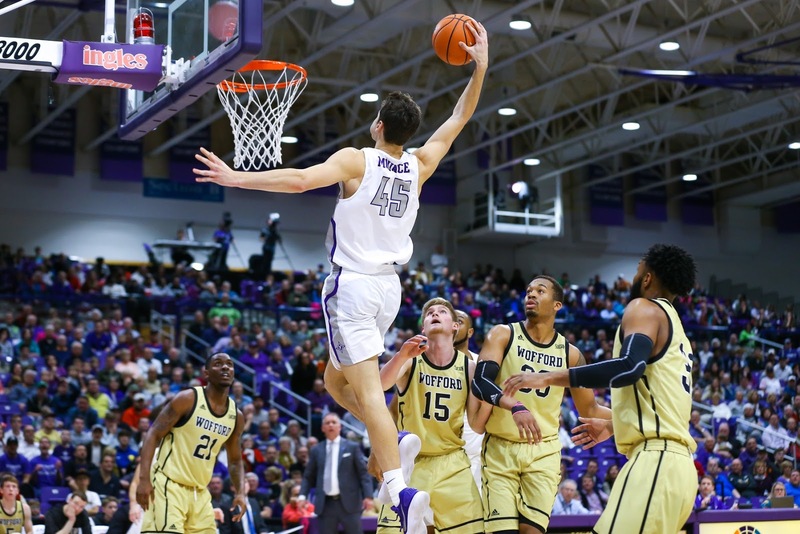 The Paladins may have had a chance to wrap up the win on Wofford's ensuing possession. But on fourth-and-goal from the six-yard line, Andre Stoddard ran up the gut for a touchdown to cut the lead to 27-14 with 3:41 left in the third quarter. That set up perhaps Furman's most satisfying drive of the season. The Paladins marched 71 yards on 16 plays and shaved 9:25 off the clock. By the time Roberts snuck into the end zone from a yard out on third down, there was only 9:10 left to play and Furman led 34-14. The drive included a fourth-and-one play in which the Paladins passed on a field goal as Roberts converted on a sneak to the Wofford 14. "I just felt like it (fourth down) was close enough that we could make it. ... I just felt like 'we've got to make this.' It would take a couple of more minutes off the clock and we could still kick a field goal," Hendrix said. "And I figured if we don't (convert), we had confidence in our defense and knew they'd have a long field. "Finishing off with a drive like that will give us a little confidence going forward." The "second half" of what's been a disjointed 2018 football season for Furman begins Saturday when the Paladins host Wofford at 1:05 p.m. Even though we're in the middle of October, the schedule changes have made it difficult for Furman to gauge exactly what kind of team it has. It's got to be hard for fans and those involved with the program to not think what could've been had the Paladins' scheduled home game against Colgate on Sept. 15 not been cancelled by the threat of Hurricane Florence. Senior captain Harris Roberts was healthy enough to likely start that game at quarterback and would've gained his first taste of significant playing time. Instead, that came the following week at ETSU. 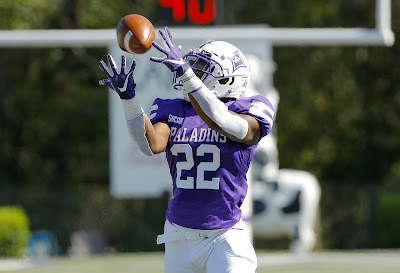 While Roberts provided a spark that night, it was extinguished by the fourth quarter as the Paladins saw a 27-6 lead disappear in a 29-27 loss. Given the way Furman easily handled Colgate on the road last season, it's not really looking too much through purple-tinted glasses to see how this team could be 3-2 overall and 2-0 in the Southern Conference. Reality is that the Paladins are 1-3 and 1-1 in the league and there's no time for thinking about couldas and wouldas. Not with the No. 4-ranked Terriers (4-1, 3-0) coming to town. The week before last Saturday's bye, Furman piled up 577 yards of total offense in a 44-38 win over Western Carolina. Just over five minutes into the second quarter that day, the Paladins eclipsed their previous season-high total in points. "It's been a little more fun the last couple of weeks because offensively we finally feel like we can go forward. We've kind of figured out who we can be," Furman coach Clay Hendrix said. "And we're not far from playing pretty good on defense at times. We've just kind of had that four, five or six plays in a game that's really hurt us." 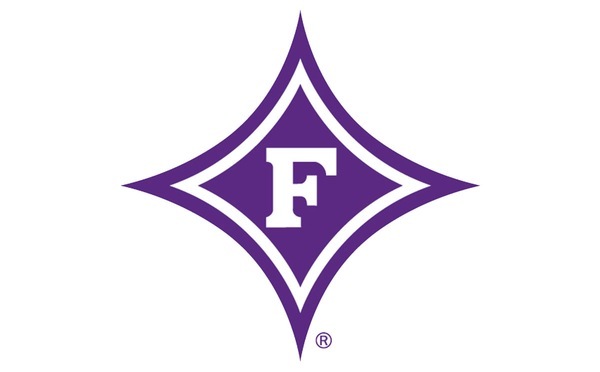 While Western Carolina stud quarterback Tyrie Adams made some incredible throws to rack up 424 yards and five touchdowns passing at Furman, he was limited to 48 yards rushing on 19 carries. Adams entered that day leading the Southern Conference in rushing with an average of 99 yards per game. WCU running back Connell Young, who entered that day second in the league in rushing at 97 yards per game, was limited to 52 yards on 14 carries. Furman will likely need an even stronger effort against the run Saturday to try to stop a Terriers team that's tied for the FCS lead in rushing at 388.8 yards per game. Of the 10 different Wofford players that have at least seven rushing attempts, each one is averaging at least 5.6 yards per carry. As a team, the Terriers average an eye-popping 7.3 yards per carry. Wofford's offensive numbers under new head coach Josh Conklin have sort of overshadowed a defensive unit that ranks sixth in the FCS, allowing only 254 yards per game. The Terriers rank ninth in the country in scoring defense, allowing 15.2 points per game. "They're just pretty solid everywhere," Hendrix said. "Their (defensive) philosophy has always kind of been to keep the ball in front and don't give up big plays. They try to force people to go 10 or 12 plays (on a drive). It's kind of hard to do that without something happening, like a penalty or turnover." Furman will have to take advantage of its scoring chances Saturday. That's something that didn't happen in a pair of losses at Wofford last season. "In those two games, we had four possessions where we had the ball inside the five and scored three points," Hendrix said. "We had chances to take control. ... Then in the second half of the playoff game, we just self-destructed and they just wore us down. "We've practiced good and I think we have a little confidence. I'll be surprised if we don't go get after them."